Adetailed description of the 16th century British general Nelson’s arm amputation; a portrait of a girl ravaged by worms that people thought fairies had worked on her. These are some of the items in journals of British naval surgeons recently catalogued in the British National Archives. It is crucial to the understanding of medical history. For instance, a case of 12-year-old Ellen McCarthy who vomited a 220 cm worm during her passage to Quebec in 1825. Surgeon P Power first gave her Calomel, a mercury compound popular at that time. When it did not work, he injected her with Ol Tereb— probably turpentine. It made her feel better. The surgeon reported to his seniors he would have “no hesitation in adding his testimony to others in favour” of the medicine. 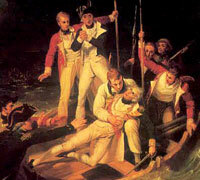 In contrast, Nelson’s treatment was straightforward. His surgeon wrote: “Continued getting well fast. The sore reduced to the size of a shilling.” The pages of the tightly written diary contain sketches of medical conditions and treatments, exotic plants, animals and people the surgeons met on their voyages.